As usual Piorot gets his murderer. Huge Agatha Christie fan. Have read many of her books. Many more to read. Hercule Poirot consults in the death of a girl during a Halloween party. Lots of red herrings are thrown to confuse the reader....or are they? Debonaire Poirot in tight patent leather shoes, treading the English countryside during his investigation is quite an image throughout the book. He manages to solve the crime and prevent another murder, without even once talking about those little grey brain cells. 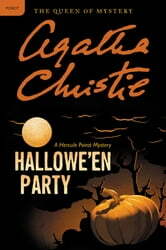 I really enjoyed this Poirot storyline, it kept me on my toes. I kept thinking who I thought the guilty person was, wrong. It was a surprise who it ended up being. Always interesting how he puts it all together-- Ms Christie was enormously creative.